For the Japanese band, see Field of View. For other uses, see Field of view (disambiguation). Angle of view can be measured horizontally, vertically, or diagonally. A 360-degree panorama of the Milky Way at the Very Large Telescope. Such a panorama shows the entire field of view (FOV) in a single image. An observer would perceive the Milky Way like an arc of stars spanning horizon to horizon – with the entire FOV mapped on a single image this arc appears as two streams of stars seemingly cascading down like waterfalls. The field of view (FoV) is the extent of the observable world that is seen at any given moment. In the case of optical instruments or sensors it is a solid angle through which a detector is sensitive to electromagnetic radiation. In the context of human vision, the term "field of view" is typically only used in the sense of a restriction to what is visible by external apparatus, like when wearing spectacles or virtual reality goggles. Note that eye movements are allowed in the definition but do not change the field of view. If the analogy of the eye's retina working as a sensor is drawn upon, the corresponding concept in human (and much of animal vision) is the visual field. It is defined as "the number of degrees of visual angle during stable fixation of the eyes". Note that eye movements are excluded in the definition. Different animals have different visual fields, depending, among others, on the placement of the eyes. Humans have a slightly over 210-degree forward-facing horizontal arc of their visual field, while some birds have a complete or nearly complete 360-degree visual field. The vertical range of the visual field in humans is around 150 degrees. The range of visual abilities is not uniform across the visual field, and varies from animal to animal. For example, binocular vision, which is the basis for stereopsis and is important for depth perception, covers 114 degrees (horizontally) of the visual field in humans; the remaining peripheral 40 degrees on each side have no binocular vision (because only one eye can see those parts of the visual field). Some birds have a scant 10 or 20 degrees of binocular vision. Similarly, color vision and the ability to perceive shape and motion vary across the visual field; in humans color vision and form perception are concentrated in the center of the visual field, while motion perception is only slightly reduced in the periphery and thus has a relative advantage there. The physiological basis for that is the much higher concentration of color-sensitive cone cells and color-sensitive parvocellular retinal ganglion cells in the fovea – the central region of the retina, together with a larger representation in the visual cortex – in comparison to the higher concentration of color-insensitive rod cells and motion-sensitive magnocellular retinal ganglion cells in the visual periphery, and smaller cortical representation. Since cone cells require considerably brighter light sources to be activated, the result of this distribution is further that peripheral vision is much more sensitive at night relative to foveal vision (sensitivity is highest at around 20 deg eccentricity). In machine vision the lens focal length and image sensor size sets up the fixed relationship between the field of view and the working distance. Field of view is the area of the inspection captured on the camera’s imager. The size of the field of view and the size of the camera’s imager directly affect the image resolution (one determining factor in accuracy). Working distance is the distance between the back of the lens and the target object. In remote sensing, the solid angle through which a detector element (a pixel sensor) is sensitive to electromagnetic radiation at any one time, is called instantaneous field of view or IFOV. A measure of the spatial resolution of a remote sensing imaging system, it is often expressed as dimensions of visible ground area, for some known sensor altitude. Single pixel IFOV is closely related to concept of resolved pixel size, ground resolved distance, ground sample distance and modulation transfer function. In astronomy, the field of view is usually expressed as an angular area viewed by the instrument, in square degrees, or for higher magnification instruments, in square arc-minutes. For reference the Wide Field Channel on the Advanced Camera for Surveys on the Hubble Space Telescope has a field of view of 10 sq. arc-minutes, and the High Resolution Channel of the same instrument has a field of view of 0.15 sq. arc-minutes. Ground-based survey telescopes have much wider fields of view. The photographic plates used by the UK Schmidt Telescope had a field of view of 30 sq. degrees. The 1.8 m (71 in) Pan-STARRS telescope, with the most advanced digital camera to date has a field of view of 7 sq. degrees. In the near infra-red WFCAM on UKIRT has a field of view of 0.2 sq. degrees and the VISTA telescope has a field of view of 0.6 sq. degrees. Until recently digital cameras could only cover a small field of view compared to photographic plates, although they beat photographic plates in quantum efficiency, linearity and dynamic range, as well as being much easier to process. In photography, the field of view is that part of the world that is visible through the camera at a particular position and orientation in space; objects outside the FOV when the picture is taken are not recorded in the photograph. It is most often expressed as the angular size of the view cone, as an angle of view. 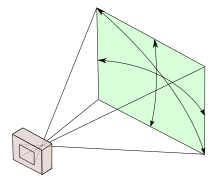 For a normal lens, the diagonal field of view can be calculated FOV = 2 arctan(SensorSize/2f), where f is focal length. The field of view in video games refers to the field of view of the camera looking at the game world, which is dependent on the scaling method used. ^ "Cascading Milky Way". ESO Picture of the Week. Retrieved 11 June 2012. ^ Alfano, P.L. ; Michel, G.F. (1990). "Restricting the field of view: Perceptual and performance effects". Perceptual and Motor Skills. 70: 35–45. doi:10.2466/pms.1990.70.1.35. ^ a b Strasburger, Hans; Rentschler, Ingo; Jüttner, Martin (2011). "Peripheral vision and pattern recognition: a review". Journal of Vision. 11 (5): 1–82. doi:10.1167/11.5.13. ^ Strasburger, Hans; Pöppel, Ernst (2002). Visual Field. In G. Adelman & B.H. Smith (Eds): Encyclopedia of Neuroscience; 3rd edition, on CD-ROM. Elsevier Science B.V., Amsterdam, New York. ^ a b Traquair, Harry Moss (1938). An Introduction to Clinical Perimetry, Chpt. 1. London: Henry Kimpton. pp. 4–5. ^ Howard, Ian P.; Rogers, Brian J. (1995). Binocular vision and stereopsis. New York: Oxford University Press. p. 32. ISBN 0-19-508476-4. Retrieved 3 June 2014. ^ Oxford Reference. "Quick Reference: instantaneous field of view". Oxford University Press. Retrieved 13 December 2013. ^ Wynne, James B. Campbell, Randolph H. (2011). Introduction to remote sensing (5th ed.). New York: Guilford Press. p. 261. ISBN 160918176X.